In 3-quart heavy saucepan, stir together sweetener, cornstarch and salt with whisk. Gradually stir in milk and half-and-half. Cook over medium heat 8 to 10 minutes, stirring constantly, until mixture thickens slightly. Remove from heat. In small bowl, beat egg yolk until slightly thickened. Gradually stir in about 1 cup hot cream mixture. Add yolk mixture to remaining hot cream mixture, stirring constantly with whisk. Stir in vanilla. Pour mixture through fine-mesh strainer into large bowl; discard solids. Cool 1 hour, stirring occasionally. Press plastic wrap on surface of cream mixture; refrigerate 8 to 24 hours. 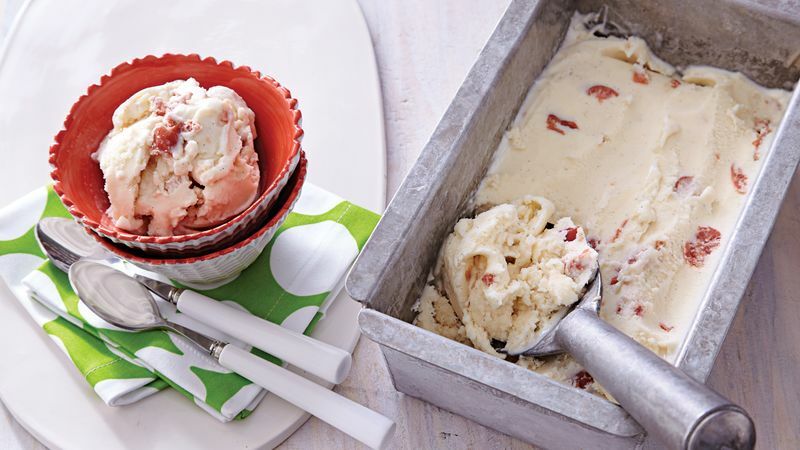 Pour mixture into 1 1/2-quart ice-cream freezer and freeze according to manufacturer’s directions; stir in cherries and bourbon halfway through freezing. Let stand at room temperature 5 to 10 minutes before serving. To Freeze: Freeze ice cream in freezer container up to 1 month.